320 pages | 3 B/W Illus. Exploring NATO’s post-Cold War determination to support democracy abroad, this book addresses the alliance’s adaptation to the new illiberal backlashes in Eastern Europe, the Western Balkans and Afghanistan after the alleged ‘return of history’. The book addresses the question of what has driven NATO to pursue democratisation in face of the significant region-specific challenges, and what can explain policy expansion or retrenchment over time. Explaining NATO’s adaptation from the perspective of power dynamics that push for international change and historical experience that informs grand strategy allows wider inferences not only about democratisation as a foreign policy strategy but also about the nature of the transatlantic alliance and its relations with a mostly illiberal environment. Larsen offers a theoretical conception of NATO as a patchwork of one hegemonic and several great power interests that converge or diverge in the formulation of common policy, as opposed to NATO as community of universal values. This volume will appeal to researchers of transatlantic relations, NATO’s functional and geographical expansion, hegemony and great power politics, democracy promotion, lessons of the past, (Neoclassical) Realism, alliance theory, and the crisis of the liberal world order. "A brilliant achievement: theoretically rich, empirically arresting – written with intelligence, lucidity and a breath-taking width of knowledge. This is one of the few works on NATO that is a truly challenging read." - Christopher Coker, Professor of International Relations, London School of Economics. "A brilliant theoretically and empirically informed work on NATO's advancement of democracy in Europe and beyond since the mid-2000s. Larsen has accomplished the rare feat of producing a work equally useful to policy practitioners and those in the academy. Realists and liberals alike will find compelling arguments about the substantive role the promotion of democratic values have and can still play in NATO's strategy." - Karl W. Eikenberry, Director of the U.S.-Asia Security Initiative at Stanford University, former U.S. Ambassador to Afghanistan and Deputy Chairman of the NATO Military Committee. "A theoretically sophisticated and empirically rich account of NATO’s evolution since the Cold War’s end. Larsen offers a compelling argument as to why and how a collective defense organization added to its portfolio a prominent focus on promoting democracy. In so doing, he not only offers a fresh take on NATO’s past, present, and future, but also advances our understanding of how the interplay between power, domestic factors, and ideas shapes geopolitics." - Charles A. Kupchan, Professor of International Affairs, Georgetown University, and Senior Fellow, Council on Foreign Relations. 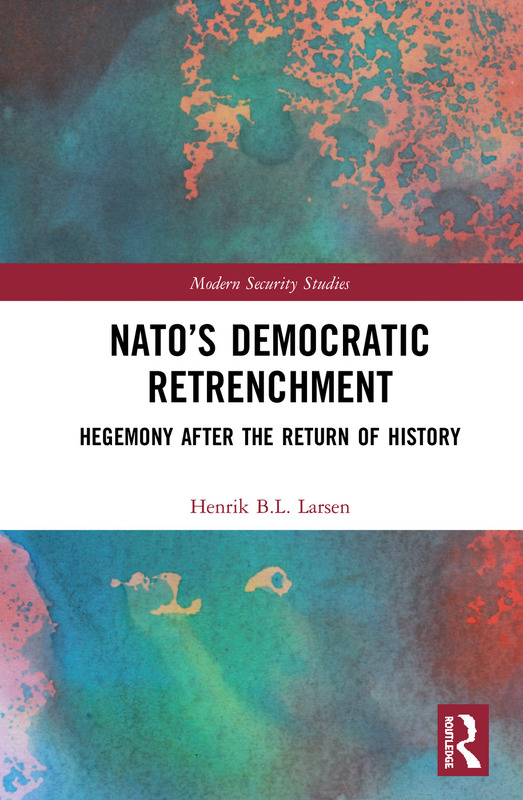 "Henrik L. Larsen has provided a much needed study of the role of democracy support in the Eastern European shatter zone where the transatlantic and Eurasian security systems meet. In furthering ‘democratic realism’ and hegemony the book makes a valuable theoretical contribution. It is one of few truly enjoyable reads on the topic." - Asle Toje, Scholar and member of the Norwegian Nobel Committee. Henrik B.L. Larsen was previously a Research Fellow with the Belfer Center at Harvard University's Kennedy School and an EASI-Hurford Fellow with the Carnegie Endowment for International Peace. He completed his PhD jointly between the Danish Institute for International Studies (DIIS) and the University of Southern Denmark and was Visiting Researcher at Stanford University's Center on Democracy, Development and the Rule of Law.